During the Fed's move to increase short term interest rates, some have expressed concerns due to the yield curve's increased flattening, i.e., short rates moving higher versus long term interest rates. 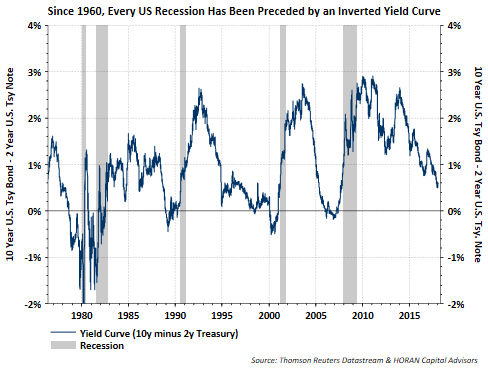 This increased flattening move can be seen in the below chart and the concern centers around the fact that every recession since 1960 has been preceded by an inverted yield curve, i.e., short term rates higher than long term rates. The move by the Fed to push short term rates higher is part of a normal process to get interest rates back to a normalized level. For many investors it may seem difficult to believe since it has been so long ago, but the equity markets do go through negative returning periods. The average intra-year decline for the S&P 500 Index since 1980 is 14% and the last double digit decline was in February 2016, nearly two years ago. So what in the world is going on that has stocks in what seems an uninterrupted climb? 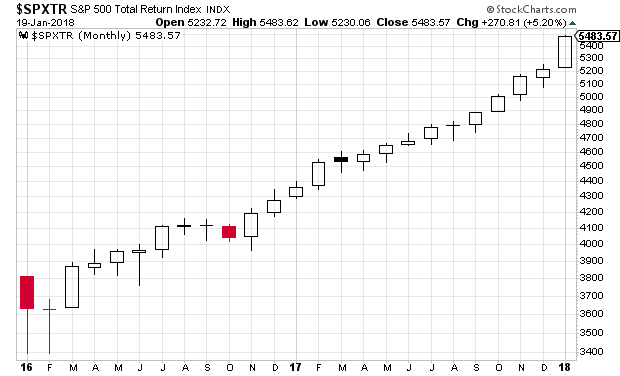 The below 'monthly' chart shows the S&P 500 Total Return Index since the beginning of 2016. Over the course of the two years, 2016 and 2017, the S&P 500 Index has experienced only three negative returning months (red bars) with no down months in 2017. The last bar on the chart represents the January 2018 return and the start of this year has been decidedly bullish. In May 2011 crude oil (WTI) hit $113 per barrel and remained elevated at or near that level until the summer of 2014. Given the high price of crude and the expansion of fracking at that time, crude supply continued to grow until peaking in mid 2017. I wrote about the high crude supply level in mid 2017 and its impact on keeping oil prices down, Higher Oil Prices Contend With Too Much Supply And Higher Energy Efficiency. 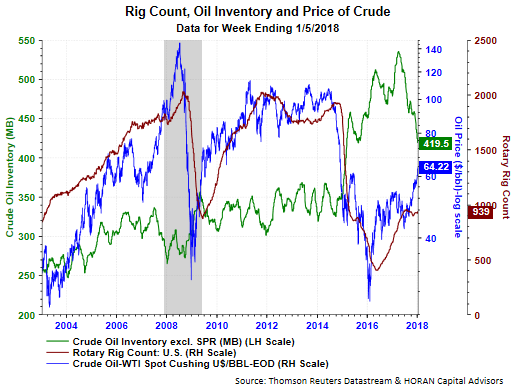 Today, we are seeing crude oil inventory decline at a fairly rapid rate as can be seen with the green line in the below chart. Today's weekly AAII Sentiment Survey reports a drop in bullish investor sentiment of 11.1 percentage points to 48.7%. The bullish sentiment reading has been on a steady move higher since November 16 when the bullishness reading was 29.4%. The weekly readings tend to be more volatile and one can look at the 8-week moving average in order to eliminate some of this volatility. 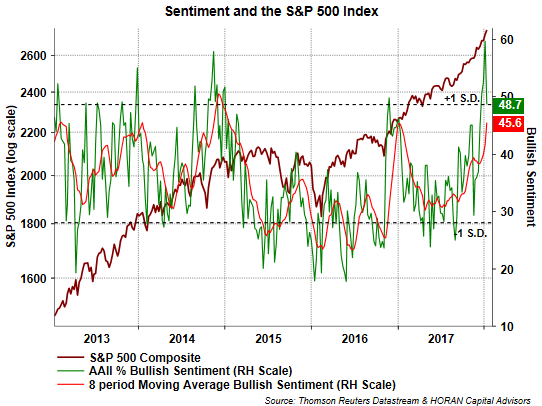 As a result, although the sentiment reading fell this week, the longer period average of bullish sentiment increased to 45.6%, largely due to dropping the 29.4% bullishness reading from November 16. For the first part of 2017 low volatility equities were outperforming their high beta counterparts. However, as tax reform talk began to look more a reality in late August, high beta stocks resumed their outperformance that really began in early 2016. 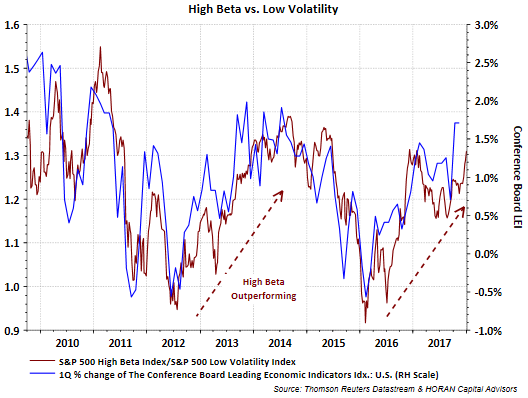 As the maroon line in the below chart shows, this high beta outperformance is carrying over into the beginning of 2018. I am re-reading Justin Mamis' book, The Nature of Risk, a worthwhile read by the way, and being reminded of the dissemination of information prior to the internet age, which is difficult for many to believe if they did not work in investments at that time. Simply gauging market sentiment prior to each day's market open at that time was much different than it is today, of course. As he notes in his book, when one inquired about, say, a higher market, the most appropriate answer was there simply were "more buyers than sellers" that day. In today's proliferation of business cable channels, that type of response will not sell many advertisements. This focus on buyers and sellers is really an evaluation of investor sentiment and is one reason I write about sentiment reports on a fairly regular basis. To that end, the American Association of Individual Investors reported Sentiment Survey results last week and individual investor bullish sentiment jumped 7.1 percentage points to 59.8%. Most of this bullish improvement came from the prior week's bearish survey participants as bearish sentiment decline 5.1 percentage points to 15.6%. This spike in bullish sentiment can be seen in the below chart. The Dow Jones Industrial Average pushed through 25,000 in the first week of 2018. True to form, the President weighed in on this record and indicated 30,000 is the next target, skipping over the 1,000 increment target milestones. His comment was replayed numerous times on television by the financial media Thursday with many commentators spinning his comment as hyperbole, but might a Dow target of 30,000 in 2018 be reasonable? The below chart displays the calendar year returns for the Dow Jones Industrial Average going back to 1980. Also included on the chart are red dots representing the largest intra-year drawdown or decline. Looking at the mid 1990's returns, there was a five year period, 1995 - 1999, where the Dow returns ranged from 16% to 33%, but with four of the year's return above 20%. So what would it take for the Dow Index to hit 30,000? A 20% return. The point being, with the Dow Index trading at a large absolute number level, these 1,000 or 5,000 point moves are not out of the realm of even a reasonable possibility. Just as today a 100 or 200 point decline in the Dow is not a significant drop at all, i.e., less than a tenth half of a percent. 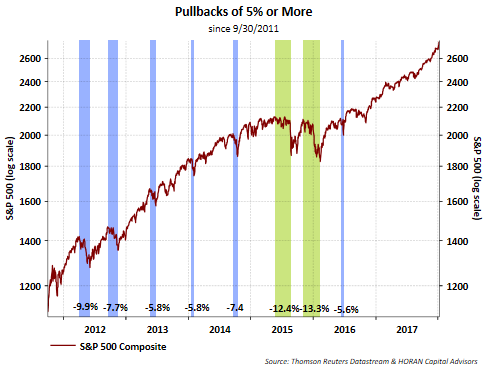 Importantly for the market and investors though, is the fact the market has not experienced a double digit pullback since February of 2016, nearly a two year period. The market will experience one of these double digit declines as it did 1997 and 1998, but looking at those prior years, the market can recover and generate strong returns for the entire calendar year period. One equity market phenomenon that played out in 2017 was the fact larger capitalization stocks were larger contributors to market returns. 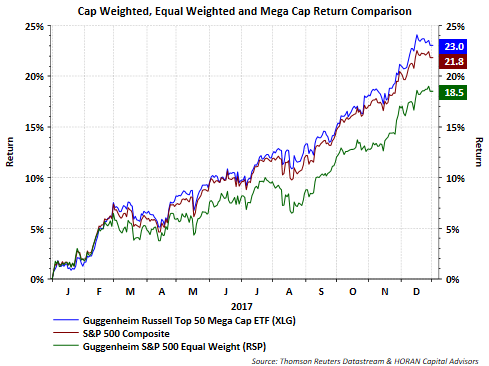 One way to evaluate this is to review the return of the cap weighted S&P 500 Index versus the equal weighted Guggenheim S&P 500 Index (RSP). As the below chart shows, the equal weighted index underperformed the cap weighted S&P 500 Index by more than 300 basis points. Additionally, the largest 50 stocks by capitalization (XLG) outperformed both the the S&P 500 Index and the equal weighted S&P 500 Index. The end of Friday trading was certainly interesting as the last thirty minutes of the trading day incurred most of the day's half of a percent loss. A few Twitter posts I read were comments in the vain of "this is the selling I have been anticipating." The market is over due for a pullback.